Paul is an accomplished square-rig sailor and nautical history buff. 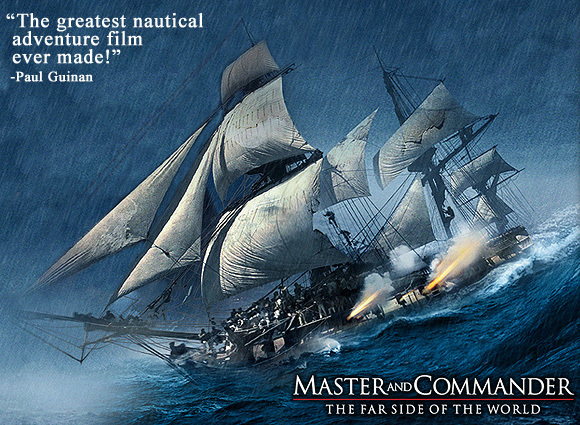 He’s also a huge fan of Horatio Hornblower and Master and Commander. 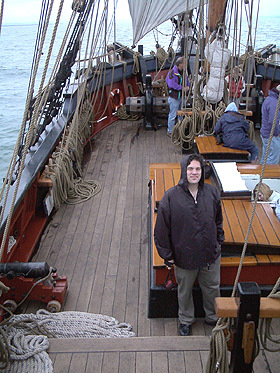 Therefore, every year he takes a little time off to sail the high seas with his wife, Anina, aboard the Lady Washington. 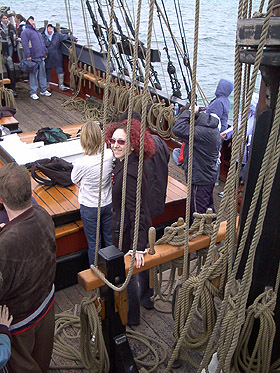 The Lady is a replica of a 19th-century square-rigger. 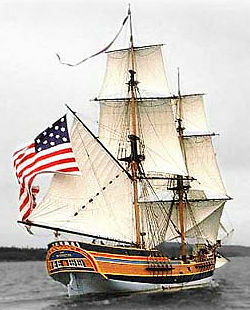 She played the 1812 brig U.S.S. Enterprise in the motion picture Star Trek: Generations (depicted at right), as well as the H.M.S. Interceptor in Pirates of the Caribbean. 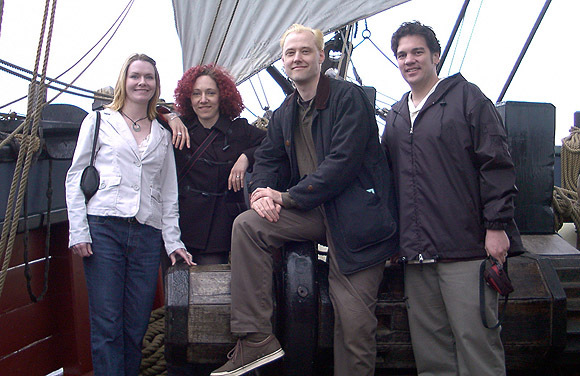 In May 2004 Paul and Anina shanghaied David (of Mercury Studio fame--it was his birthday) and Robbyn Hahn for an excursion out on the Pacific Ocean--to May 1804! 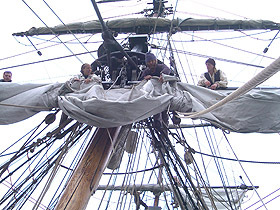 Above left: The fore course is furled. Above right: Anina “stands by the braces” (as Riker called out in Star Trek: Generations). 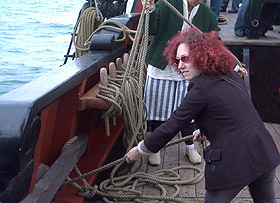 She helped haul in the foresail brace line, preparing to tie it off on a nearby belaying pin. 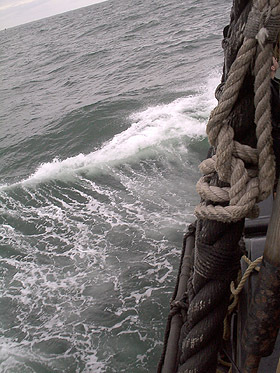 Left: Once under sail, we sped along at a half-dozen knots or so. At times the pitch and roll was quite impressive, especially when we were tacking. The captain was thrilled with the dramatic sailing conditions! 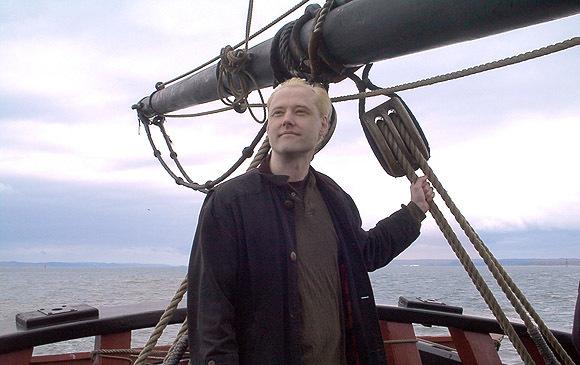 Below: Paul is in heaven... at the ship’s stern, under a spanker boom. Movie fans may recall this boom as the one Johnny Depp knocks Orlando Bloom onto, dangling him out over the side of the vessel, in Pirates of the Caribbean. Speaking of Johnny Depp, did you know he owns one of Paul's father's paintings? Read Paul’s account of the most famous sea battle in maritime history.